During the night of 22nd/23rd July (local time), the students of the Incoherent Scatter Radar (ISR) School finally got to run their own radar experiments. The control room was busy from 16:00 h to 07:00 h the next morning, and a lot of data was obtained. 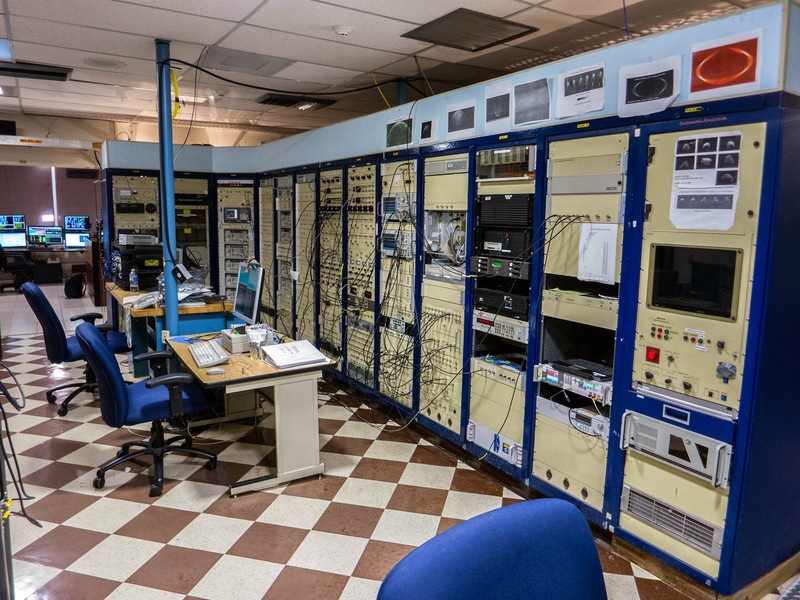 In addition to the Arecibo ISR, also the EISCAT UHF and VHF radars, the Sondrestrom ISR, the Millstone Hill ISR, and PFISR were operating to provide context information for the student experiments – or indeed to be used actively by the students. 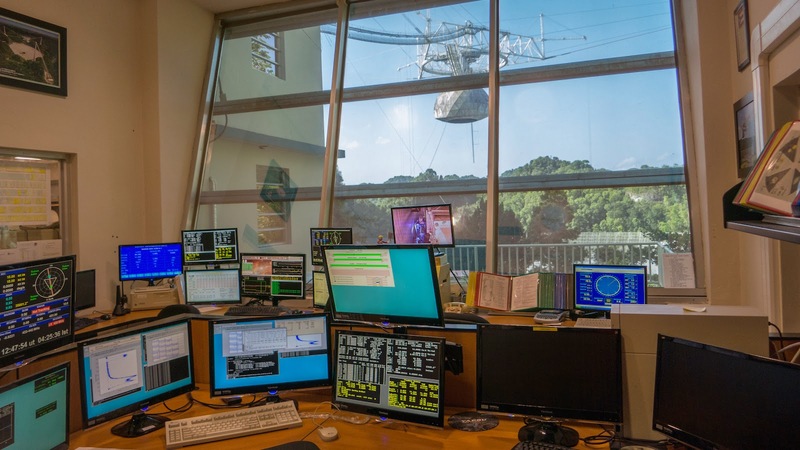 Here we present some impressions from the Arecibo control room. The first photo above was indeed taken on the morning after the long experiment night, since in darkness the transmitter feeds and the platform were not visible. 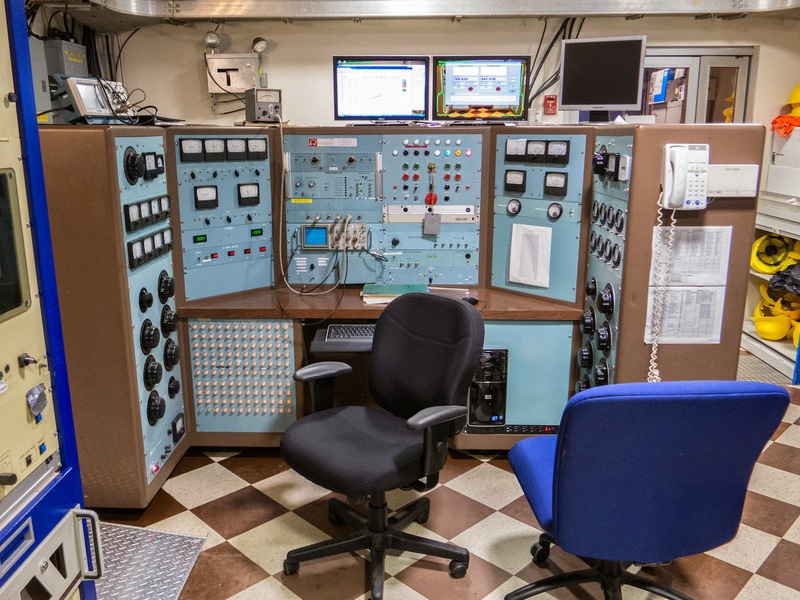 The next image is the transmitter control console. This is were the power is controlled. Part of the transmitter control console is this panel with altogether 120 control lights indicating that indeed everything is ok. 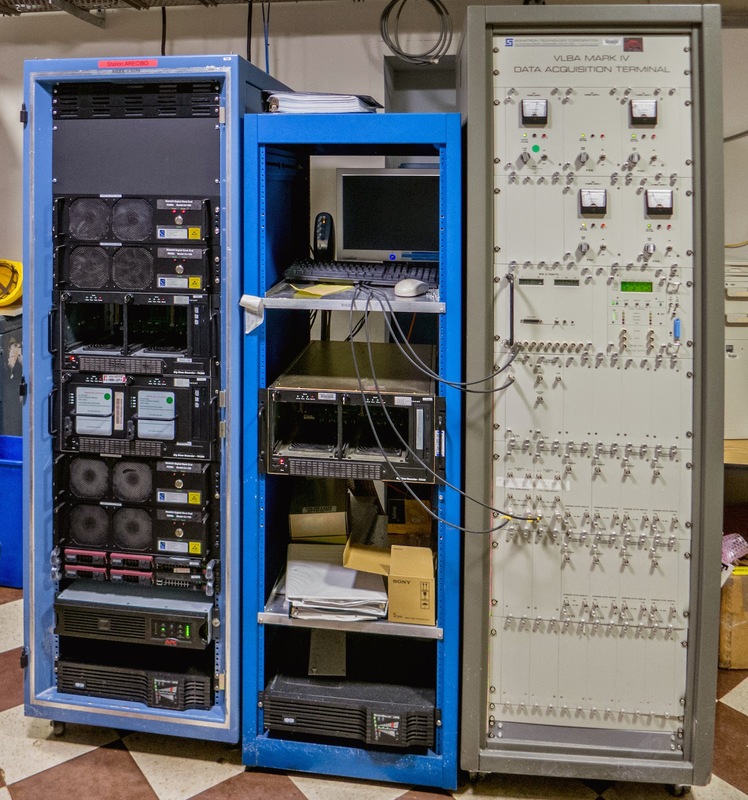 This long rack contains the receiver system where the radar signals are digitised and processed until they end up on some harddisk, from where they can be post-analysed and fed into the Madrigal database, which holds most of the world's incoherent scatter radar data. 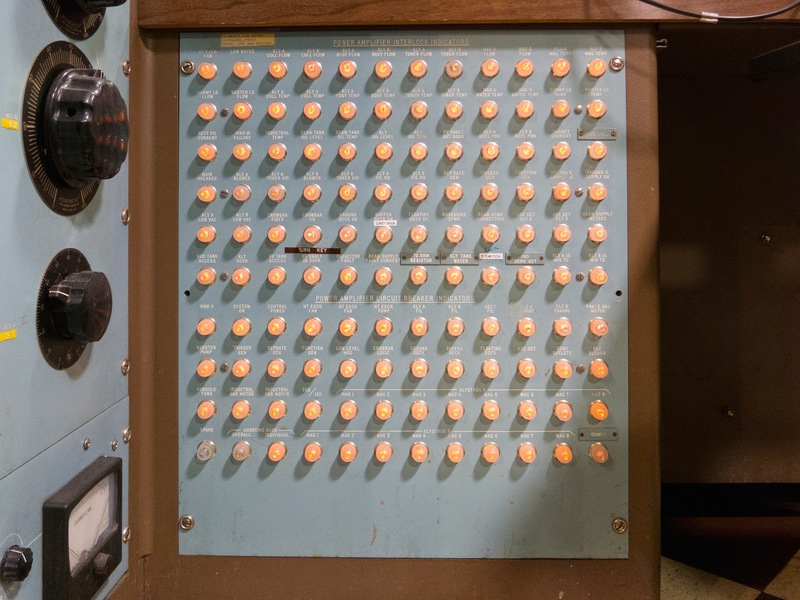 This rack of recording equipment has nothing to do with the radar experiments. The Arecibo antenna is also used as an extremely powerful telescope for radio astronomy. One important task are so-called VLBI experiments. The acronym stands for Very Long Baseline Interferometry, where several radio telescopes around the globe look at the same target in the radio sky and thereby increase resolution of the received signals. The data are recorded on specialised, portable harddisk systems, which are then shipped to a central facility for analysis. In any technical centre and control room, you find gems of local humour. 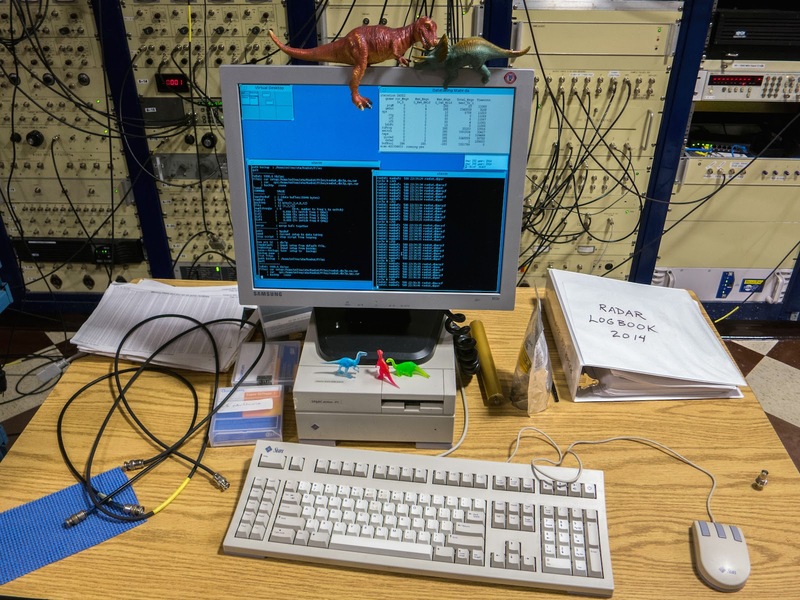 Here it's (among others) a computer console, which is decorated with dinosaurs. What might be mistaken as the work place of an operator enthusiastic about Earth's early history is in fact a reference to the age of the computer: this sparc station IPC is approaching its 20th birthday, which is indeed ancient in computer terms. But why change it if it performs its specialist tasks as brilliantly as ever? ISR School: Don't Feel Like Walking? ISR School: It's Cantenna Time Again! ISR School is under way! ISR School: We are on our way!